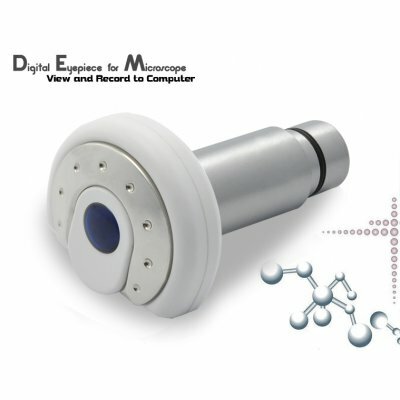 Successfully Added Digital Eyepiece for Microscope - View and Record to Computer to your Shopping Cart. If you're looking for a way to capture and save images and record video from your microscope then you've found the right product. This easy to use digital eyepiece for microscopes connects to the USB port on your computer and gives you a real-time image from your microscope-- directly on your computer screen! This is the best way to view high resolution images of hair, skin, microchips, currency and more, and without having to bend over your microscope and squint with one eye to do so. If you own a microscope then this digital eyepiece will make using your microscope easy and fun again for the whole family. The image quality of this digital eyepiece is simply amazing too. This is because the K87 uses a 1/2 inch 1.3 megapixel image sensor for delivering high image quality and remarkable detail like you have never seen before. Included with this digital eyepiece is a DVR software kit for recording those beautiful images in 1280x1024 videos and photos. This makes sharing your high resolution images with your friends, family, or the internet, easier and more enjoyable than ever. You don’t have to be a professional to use the K87 either. With the easy setup and user friendly software, even children can get in on the action. Simply attach the eyepiece to any microscope, attach the USB cable to your computer, open the included DVR software, and position your microscope like you would normally. That’s it! You can now, view, record and capture all your favorite microscope images from the comfort of your own home. The best part of it all is that unlike a traditional eyepiece, all your friends and family can actually view the same images from the microscope at the same time! This digital eyepiece for microscopes is built using high quality components and is fully backed by our 12 month guarantee. Competitively priced for the wholesale market at about half the cost of similar products, the K87 is guaranteed to be an excellent niche market resale item for 2010. Place your bulk orders now while supplies last and we will express ship your order by tomorrow. The K87 is available only from the leaders in wholesale electronics, Chinavasion. While trial capture software is provided, it only includes basic functions and may not work on all operating systems. More advanced software is available on the internet should you need better functions like higher FPS settings and better image control. The eyepiece itself is a USB 2.0 camera which has drivers all over the internet. So if you are an experienced computer user you can get this product to work with any Operating System. This unit works on any existing microscope with caliber size 23.2mm and 30mm. This is considered the standard size for microscopes.